Van Ruisdael specialized in landscape painting and never really digressed from this art genre. He never painted human figures, even the minuscule ones that are present in his landscape and town images. Instead van Ruisdael would ask other artists, most probably from his studio in Amsterdam, to fill in the human figures in his works for him. In his early years in Haarlem Jacob van Ruisdael painted the natural dunes around his city and the flat woodland. His early offerings show an intense affiliation to nature and the solitary structure and objects against nature's great vastness. This was naturally due to the influence of his uncle, Salomon van Ruysdael, who used solitary objects to create new dimensions and concepts in composition. 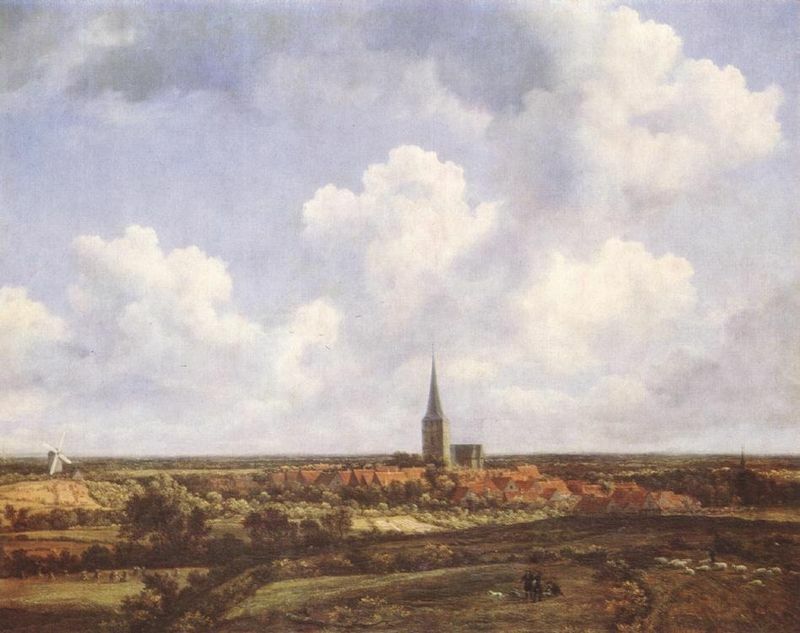 Jacob van Ruisdael was also influenced by other fellow Haarlem painters such as Jan van Goyen, Pieter de Molijn, Hercules Segers, Jan van de Velde and Claes Jansz. 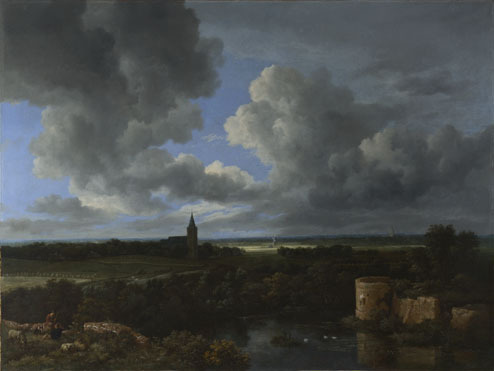 These artists were deemed 'tonal painters' and despite van Ruisdael's use of strong local color, it is evident that he was inspired by the restrained palettes of these painters. 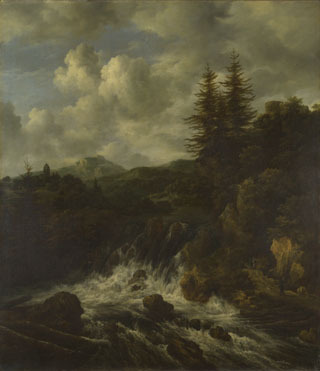 In his early works, pine forests, waterfalls and stormy skies featured heavily and van Ruisdael's fascination with trees in particular is evident in paintings such as the Landscape with a House in the Grove. During the 1650s, Jacob van Ruisdael visited Germany and absorbed himself in the natural wonder of the northern landscape and hemisphere. He developed a keen interest in the rugged mountain planes, craggy lands and old abandoned structures. It was here that he drew most inspiration for his later works whereby he created Nordic images of landscapes entirely from memory. The artist's subject matter was not original but rather his interpretation and execution of it was. He was able to add something new to his strongest work; a moral and psychological significance that was appreciated by later generations in particular. Van Ruisdael's landscapes always conveyed a gloomy, placid atmosphere evoking solitude and dark emotions. Furthermore, his paintings always instilled an overwhelming silence that is best understood through emotions rather than words. However, his images were not as intense as those of his followers. They were not loud but rather passively elevated the viewer's psychological state. 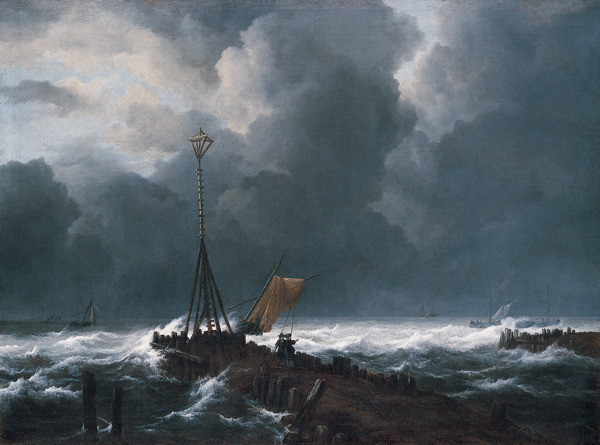 His connection to oncoming storm clouds came to symbolize the oncoming of human emotions and moods. Van Ruisdael used his work to assign personalities to the trees and structures of nature that he presented. Jacob van Ruisdael used a form of impasto - a thick type of paste that creates astounding lighting affects and reflections. When applied thickly, it can show the intensity of the brush stroke which makes expression easier. Impasto also has the wonderful effect of standing out on the canvas, creating a three-dimensional aspect. Van Ruisdael used many grey hues and tones in his paintings, generally using a monotonous palette to produce a dreary atmosphere. His main colors of preference early on were dark greens, dull yellow ochres and browns. The artist's thick application of such colors using the impasto added a new texture to the foliage, especially the trees that were typically prominent in his images. This method also served to add depth to his works. During the 1650s van Ruisdael's palette became brighter and he used lighter shades for the sun-highlighted solitary structures. He also began to use more blues to depict the sky. Van Ruisdael changed the monochromatic color scheme of traditional landscape paintings and created more colorful compositions derived from the Classical period. 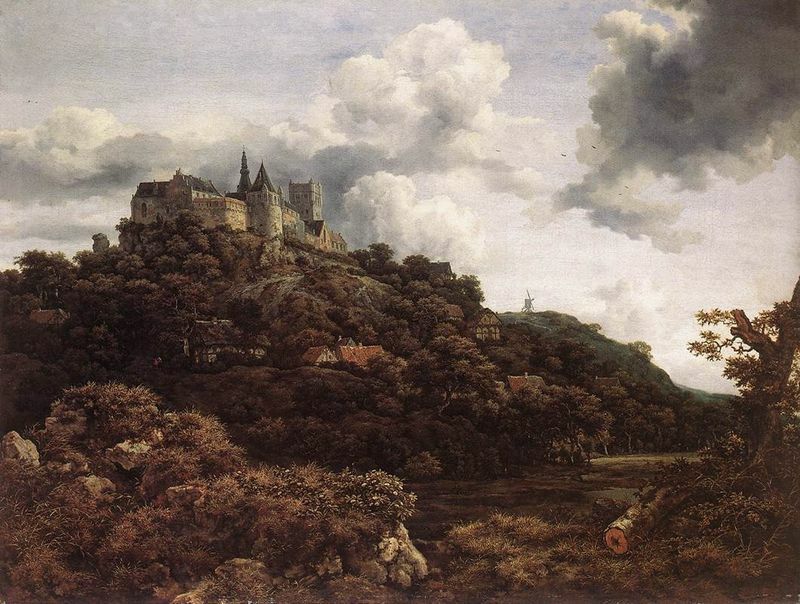 The size of his landscapes also increased at this time, as seen in Bentheim Castle, whereby the forms become more massive and the composition more spacious. Van Ruisdael began employing more accented strokes to create gnarled trees, trunks and crevices in his structures. Trees and foliage appear greener in his later works and the images starker. In Landscape with Church and Village the town's roof tops are painted in brighter and sharper reds. In Village at Winter Moonlight his brown hues become more austere and he is seen using red streaks for a more dramatic effect. Van Ruisdael completed around 100 drawings which were used as platforms for practice before creating his paintings. On his sketches he would modify the image to painting scale in order to achieve the correct composition. The artist's sketches and etchings were not as popular as his paintings and he only finished 13 etchings during his lifetime. Van Ruisdael used his etchings to try and recapture nature's textures by using various techniques through making harsh and hard markings and altering their width. In doing this the texture would match the wood or rock surfaces and it would also create a sense of depth. This technique would also apply to the foliage and objects with finer detail in using thinner, refined lines. 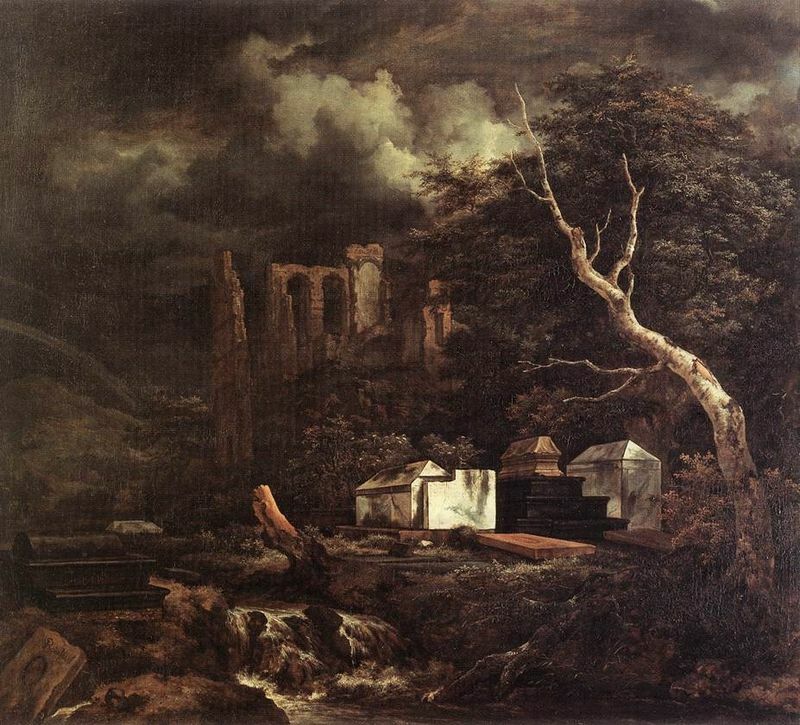 Additionally, van Ruisdael produced various layers on different sections to create both light and dark tones. It is not known who taught van Ruisdael the art of etching, as neither his father nor uncle were printmakers. 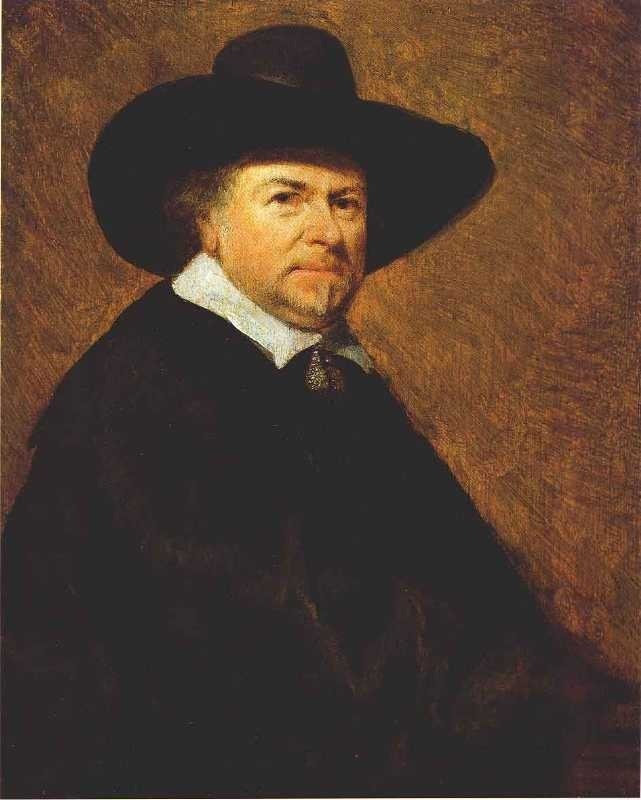 There was a large demand for prints but van Ruisdael did not engage in the process wholeheartedly because he stopped making prints in the early 1650s, either because they were not financially successful or because he found the process of matching the increasing subtlety of his painting style too time-consuming and laborious. Jacob van Ruisdael always portrayed his source of light from a sun shining weakly though the dark clouds and trees. He used sparse lighting to define the shape of his structures and subject matter amongst the enormity of the landscape. Like his uncle, van Ruisdael painted with a keen focus on the effect of light and atmosphere which would ultimately change the natural components of the landscape. Painting his images below a cloudy sky would also alter the dynamic of the image and created new compositional techniques. 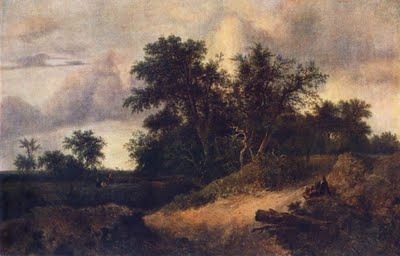 Van Ruisdael's forest paintings are always tightly composed which created a more tumultuous, dramatic and suffocating effect that would emphasize his subjects and structures. Furthermore, this helped maintain a more natural composition and defined the image's special dimensional effects. Van Ruisdael established a new way to present the skyline, especially in defining its infinite spectrum, reaching both lowlands and mountains. The artist invented various ways for the sky and land to meet and he used various tones to blur the two to create an infinite mental image. The abandoned structures and objects in his works also helped characterize his innovative compositional techniques and brought out more features in their overall shape.